The current legislative session here in Delaware has been dominated by what can only be described as big-ticket items, what I have come to call marquee issues. These have included repeal of the death penalty, new and more intrusive gun laws, and what may well prove to be the most divisive, marriage equality, or the gay marriage bill. One has to wonder, with unemployment always seeming to be hovering, around seven percent, or as the Democrats like to call it, “the new normal”, and with so-called, sunset taxes, being made permanent, with ever more regulations being passed, that will only discourage new businesses from coming to Delaware, with millions of tax dollars being wasted, if not out right stolen from the tax payers by venture capital companies hand-picked by the Markell administration, and given to politically connected, so-called green energy enterprises such as Blue Water Wind, Fisker and Bloom Energy. One has to wonder if all of these other social issues have been nothing more than a distraction? Let’s face it, it is easier to get people riled up about the social issues than it is to get them excited about jobs and the economy, especially if they have a job and are doing relatively well in their lives. Of course if you don’t have a job, and are not doing so well, it is easier to get you excited about raising taxes on those who pay for the so-called safety net programs. This has become a built-in constituency for the tax and spend Democrats. So while groups such as the 912 Delaware Patriots are all up in arms about gun legislation, and the Delaware Family Policy Council is focused on gay marriage, the number of unemployed in Delaware in March was a whopping 32,323! The conservative movement has become nothing more than a bunch of single issue sub groups that do not know how to pull together and work to defeat the real opposition, liberalism. The real issue facing this state and the nation is whether we will continue to turn towards the left leaning ideology that believes, that taxing the most productive among us, and spending more and more on pie in the sky green energy programs along with never-ending safety net programs, is the right direction to take the state and the nation. While the conservative movement of sub groups has been distracted by the shiny objects of the death penalty, gay marriage, and gun laws, the Delaware Legislature and the Governor have been proposing a budget, even before the DEFAC numbers were available. This is what one party rule has wrought here in the First State. We have a shrinking work force even as the number of unemployed rises, causing the percentage of unemployed to rise, meaning that there are fewer tax payers to pay the cost of the also increasing demand for more and more government services and so-called safety net programs. Add in that the number one employer in the state is the state, and this becomes a downward death spiral. This formula cannot be sustained. I have come to believe that the Democrats could care less about repealing the death penalty, or about passing more gun laws, and though I am sure they would like to play to one of their most loyal constituency groups, I don’t imagine they would lose much sleep over failing to pass gay marriage. Remember that on the left, often it matters just as much about the intention, as the results. But what the Democrats in Delaware are serious about is retaining power, and the power is directly connected to the purse strings. He who controls the purse strings, controls the power, and the power is being re-elected. This is something that has been lost to the conservative movement, the realization that to be able to govern, you must first win. To win you must build coalitions of those single issue sub groups. Instead, here in Delaware, we see single-minded, single issue groups working to defeat the very people who have the experience and know-how to win, and their only fault is, that they have won elections in the past. What we must learn to understand is that the number one social issue facing any person, or family, is economics. How will you buy that gun if you have no job? What tears a family apart faster than gay marriage? Money problems and unemployment, that’s what. This is not about fiscal verses social conservatives, at least it shouldn’t be. It’s not even really about left verses right, it is about how best to get people back to work in the fastest way possible, how best to build new growth in the business sector. How best to provide a stable environment to raise children the way that parents see fit, without having to bow down to government so as to receive a monthly check. If we want government out of our lives, then we must first become financially self-supporting. This goes for our personal lives as well as for our state and local governments. If we want control of the curriculum in our schools, then we must first be willing to swear off of state and federal funding and be willing to pay higher local taxes to support our schools without the strings that come attached to that outside funding. If we want less federal intrusion in our state, then again we must be willing to do without the funding that the federal government uses to blackmail the states into subservience. To do these things we must first realize that the one party rule of either party will doom us to corruption and decline. We must also be willing to, as voters, acknowledge that the Democrats in Delaware have not led us out of our downward spiral, this means that registered Democrat voters must be willing to admit that their party of choice has failed not only them, but the entire state. They must be willing to listen to the message from the opposition and to not only listen but to hear. The conservative movement must be willing to recognize that to win they must be able to attract voters from the opposition and the independents, not by changing the conservative message, but by finding a way to better deliver it. And to realize that the idealized “PURITY” that many of them seek, is not obtainable, and even if it were, it would further doom the conservative movement and the Republican Party to the ash can of history along with the Wig Party and the Federalist Party. One common thread that should be able to unite many people, is economic sustainability, and personal success. We do this by creating jobs and business growth, and by reforming the tax code and by reminding people that the so-called safety net programs were never intended to be hammocks. Once people are economically self-sufficient they will be in a better position to fend off the social evils that are causing so much trials and tribulations. It’s okay for every sub group to want the ball, but we have to be able to see the entire field if we hope to score a victory. 11 Comments on "Can’t See The Field For Looking At The Ball"
You labor on the subject of lower taxes, less government control, less government intrusion, less unemployment, etc. but by your own admission, unless you are looking for a job you aren’t listening to the drumbeat of lower taxes, less government control, etc. As a proud member of one of those ‘single-issue’ groups you mentioned we have found a way to unite a wide spectrum of people around issues. Crossing party lines in the defense of our 2nd Amendment Rights brings more diverse minds into the conservative ‘tent’. You fail to understand that those you wish to convince aren’t interested in what you have to say. I’m a conservative and very concerned with the lack of balance in our legislature. But here is where we will disagree; I choose to focus on issues that Delawareans can personally relate to and apply to their own lives and families. Unless you figure out a way to take your “Purist” approach to fiscal responsibility and balance of power to the real people in a way they can get passionate about I would suggest that your efforts will be in vain. I’m living in the real world of working families who have no money to spare, working two jobs, no time to pay attention to politics, worried about how they are going to buy groceries. You seem detached and somewhat elitist in my opinion. Almost as though you have become absorbed into the political world to the expense of the real world. My organization is not designed to promote political power strategies; we are chartered to protect the constitutional rights (and inherent responsibilities) of our members, our state and our nation. My first responsibility as part of the leadership is to fight to protect the individual rights of the members of this group and to fight for those rights however and wherever I can. Your commentary focuses a great deal on what we should be doing as though you are in a position to lecture every conservative in this state. One thing I am learning as a leader of this fine group is that you can’t ‘shame or scold’ people into doing the right thing. If they don’t see how it will directly and personally affect their lives and their families they will not be engaged. 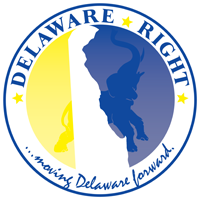 Each of our groups has a role to play to restore conservatism in Delaware – that is our common goal. Only time will tell how this will play out. In the meantime, I would suggest that you do your best to contribute to the solution rather than tearing down the rest of us who are in the trenches fighting the good fight. You have missed the thrust of the post, my point is that the opposition has been using the more social issues to distract people away from the real goal of raising taxes and spending, and that to be single minded about issues has played into their hands. And what I actually said was that, “Let’s face it, it is easier to get people riled up about the social issues than it is to get them excited about jobs and the economy, especially if they have a job and are doing relatively well in their lives.” I have to believe that working people care very much about taxes. You may have brought together a “wide spectrum of people”, but not in a sufficient number to have any real effect on general elections. You have merely tapped into a “cottage industry” within politics. You have merely siphoned off small numbers of people who care more about 2nd Amendment rights, than they care about any other issue, from other small groups. In reality all you have done is to create a new small group with no real political weight beyond a pebble in a tin can. Karen, let us for a minute put aside your affiliation with the 912 Delaware Patriots. Let me ask you whether you truly believe when you say, ” I choose to focus on issues that Delawareans can personally relate to and apply to their own lives and families.”, that more people in the state are concerned with gun rights than are concerned about rising taxes and job loss? Do you really think that a father and husband is more concerned about gun rights than with feeding his children if he is unemployed? Or is it more likely that it is people who have jobs and can afford the higher taxes, for now, that have the time and the inclination to worry about gun rights? Don’t get me wrong, I am pro 2nd Amendment, but if you truly want to protect those rights then you must appeal to the largest number of people you can to elect the people who will protect them. To do this you must have a message that appeals to the most people. You and your organization are consumed with the 2nd Amendment, the average citizen is not. This is not to say that everyone is consumed about taxes or any one issue. That is the point of the post. We must learn to build that conservative coalition to be able to protect all conservative values, not just those most important to ourselves. Karen, how do you intend to protect those rights without the political strategies? How will you affect the legislation coming down the pipeline if you do not have a political strategy? Do you truly think that by simply opposing everything and everyone you will have any effect on anything? The idea that you can effect the process without being a part of it is naïve. My apologies if I seem to be lecturing, I am merely giving my opinion, and I give it honestly and without the sugar coating, I am just a voting citizen of this state in which I was born and in which I most likely will die, where I have raised my child and in which I hope to see my grandchildren. I care about this state and this nation. I do not think we have time to tender foot around each other, we need to see the hard truths and admit our miss-steps and correct them. On this we agree. But in my view all of these sub groups of conservatism are not working together to achieve that goal. We all want to get to the same place, but because we are all taking different paths we are arriving at different times which makes us vulnerable to the opposition. I also notice that you mistake criticism for “tearing” you down. This habit of playing the victim when challenged is better suited for the opposition. I believe Frank that your concerns for the state are strong and worthwhile but they aren’t resonating with Delaware or the nation for that matter. We have seen two major elections run and lost on fiscal issues and reduced government. I can only base my path forward on what I see isn’t working from the past. I continue to believe that most people won’t agonize over our fiscal situation in this state (certainly not as long as they can collect unemployment for how many weeks now?). I do believe however that with over 300 million guns in the US owned by private citizens, that may be a popular matter. I also believe that without the 2nd Amendment we have no 1st Amendment. In fact, I can’t think of a matter more pressing right now than for the citizens of this country to maintain those rights. So that issue touches the hearts and minds of millions of Americans. 912 Delaware Patriots is also moving forward with our community education relative to Common Core. This is an issue that will bring to light how our Federal Government and our Governor has sold away parental rights in this state. Stay tuned for more on this one. I hope you would agree though that any issue relative to parental control of our children’s education will most certainly ‘rile’ more people up. This one has a strong fiscal component you’ll appreciate relative to tax dollars too. Don’t lose touch with the people you hope to influence. You may find that you no longer know what is important to them and assume that what is important to you will also work for them. I remain faithful to the individuals of my state and that includes you Frank. I respect your intention to make Delaware a better place. Don’t worry about ‘diversions’ if your message resonates it will drown out the 912 Delaware Patriots, Delaware Family Policy Council, Delaware Faith and Freedom, Founders Values, Rail Splitters, etc. If we refuse the funding then the federal and state governments have no power to influence the local districts, that simple, but that doesn’t promote the need for special interest groups to fight it, does it? The whole point of my post is that no single issue should drown out any other issue. That we must build a conservative coalition, where all voices are heard. As for what will and what won’t resonate with the majority of citizens, well no one issue will carry an election cycle, in that you are correct, neither fiscal alone, nor social issues alone, nor gun rights alone, will put the conservative movement over the top. Again please re-read the post and ignore your urge to be offended. I really don’t know where to start on this one with you Frank. Delawareans finance the public schools to the tune of $18,000+ per student, per year ranking us I think 4th or 5th in the nation in per pupil spending. We rank 48th I think in the nation as far as proficiency and that is based upon the depressed standards that have been in place for 20 years. So when you say “be willing to pay higher local taxes to support our schools” I am incredulous! As far as “we must first be willing to swear off of state and federal funding” – what do you think the chances are of that? The damage has been done sadly Frank. For now, 912 Delaware Patriots will focus on bringing the ugly truth to School Boards, Legislators, Teachers, Parents, Pastors, Administrators. As people begin to see how our rights and liberties have been stolen (how we have mindlessly given them away) I have faith that their eyes will also be opened to the broader issue of our sovereignty and their role as responsible citizens. Karen, let me clarify, what I mean is that we must be willing to completely fund our schools locally, and swear off the outside funding, thus releasing us from the unfunded mandates that come with the money. Mandates that are not popular, and often not needed or beneficial in all districts. The question of whether the money we spend is well spent is another question, no matter the source. I agree that spending more is not a guarantee of positive results. We need only look at D.C. as an example. To what end Karen? You have said you have no political strategy, so to what end do you inform the people? What will they do with that information? What do you believe they should do with it? If your goal is not to work within the political frame-work, then what does that leave? Our system allows for any and all to work to elect people who best represent their views, yet you have stated that this is not your agenda, so what do you seek? Armed rebellion? The overthrow of our government? Or simply growing the size of your organiztaion to benefit your organization? You can’t have sovereignty without renouncing federal funding and paying the balance at the local level. Delaware property taxes for school funding are very, very, very low. Maybe groups like the 912 Patriots would be better served to know what they’re talking about before entering the debate, lest they do more harm than good. On top of that, let’s hear a little more about responsibilities and a little less about rights. With Obama care and it’s obvious flaws on the verge of being implemented. I expect to see even more distractions in the coming year. Delaware is in decline and decine is not a condition it is a decision. Delaware Politics is defined by big egos and small minds restricted by the Dead Weight of Tradition. In our case every significant area of importance Delaware has lost ground in the last 20 years, commensurate with the decline of the GOP. The decline will get worse as last week the party chose to stay the course with a GOP with no plan, no structure and no grip on reality. The Dems are not smart, the GOP in De is clueless. NCC is adrift and no one does anything. Back to answer Frank’s original argument, …. the observation made by Frank is due to design. Get all the controversial social bills and legislation out of the way by Mother’s Day, … then focus the rest of the session on the money….